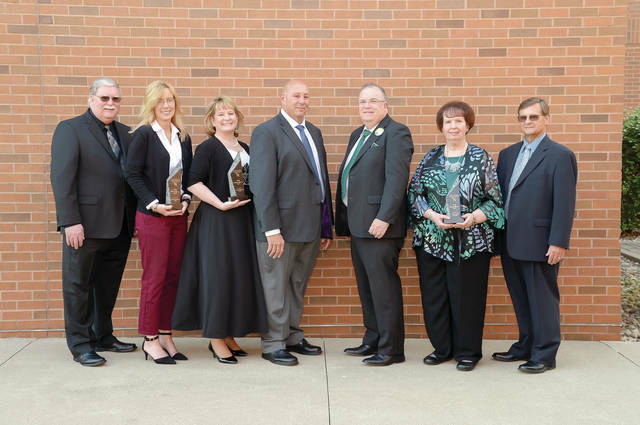 The 2018 Making a Difference Award recipients are shown with representatives from the left: Bill Priest and Shannon Zellers, Quadco Rehabilitation Center; Sally Taylor, Parkview Physicians Group; Peter Beck, NSCC Foundation Board chair; Dr. Michael Thomson, NSCC president; and Carol and Ed Nofziger. The Northwest State Community College Foundation recently hosted its annual Green Carpet Event, “Denim & Diamonds,” and raised over $70,000. All proceeds from the event go directly to student scholarships. A highlight of the evening was the presentation of the 2018 Making a Difference Awards, which were created by the NSCC Foundation as a way to recognize and celebrate an individual, business, and organization in the six-county area committed to improving their communities. This year’s recipients were Ed and Carol Nofziger, Parkview Physicians Group, and Quadco Rehabilitation Center. In addition to the Making a Difference Awards, the Green Carpet Event included a musical performance by Kerry Patrick Clark, and a stage show featuring “Magic With Eli.” Gourmet food stations, a cash bar, and a silent auction rounded out the festivities, as the auditorium and surrounding areas were decorated in the event’s “Denim & Diamonds” theme. https://www.fcnews.org/wp-content/uploads/sites/45/2018/06/web1_NSCC-making-a-difference.jpgThe 2018 Making a Difference Award recipients are shown with representatives from the left: Bill Priest and Shannon Zellers, Quadco Rehabilitation Center; Sally Taylor, Parkview Physicians Group; Peter Beck, NSCC Foundation Board chair; Dr. Michael Thomson, NSCC president; and Carol and Ed Nofziger.